Harley x Joker is the best known, if not the most popular, Harley ship out there. And it’s understandable; there wouldn’t be a Harley Quinn if there wasn’t a Joker for her to fall in love with first! But this is one of the most controversial ships you can find in any of the DC universes. And for good reason! Their relationship and lacktherof have both been canon, the relationship is far from healthy even in the best of circumstances, and there are several other ships out there. But on the other hand, who is Harley Quinn without her Joker? The most obvious argument for HQxJ is that without Joker, there’s no Harley. We’d still have sensible, genius Harleen Quinzel. But by falling in love with the Joker, sweet Harleen turned into insane Harley. Even the first comic book she showed up in was called Mad Love. The Joker defines Harley. He was insane, so she’s insane. He was a homicidal maniac, so she became a homicidal maniac. What Mistah J defined himself as, that’s what Harley latched onto. So one can’t toss Joker aside when contemplating Harley’s love life. Finally, no matter what the Joker did, Harley was still in his corner. The way that the Joker was broken seemed to fit with the way Harley Quinn broke herself for him. By defining herself around the Joker, she made herself fit him perfectly. If the Joker was a “little rough”, Harley didn’t care. Whether she was a masochist, or she simply wouldn’t know what to do with herself without him, the Joker was her world. You can almost hear the ranting rages of the feminists already. Crude jokes aside, it’s definitely an important thing to note that the Joker was abusive of Harley. In some DC universes, it was little more than cartoon violence. But in other cases, it was nothing short of raw abuse. The sort that, in many peoples opinions, should never be romanticized. Several DC artists have used this as their reason to cut off Harley and Mistah J’s relationship, making the ship… no longer canon? It gets a little tricky juggling several universes, but it looks like it’s more or less accepted that Modern Harley is flyin’ solo. The writers have used the abuse shown in Classic Quinn’s world to break the mad lovers apart. As far as Classic Quinn is concerned, the Joker never seemed to care much for Harley anyways. She tended to cramp his style and interfere with his plans, leading to more *gasp* abuse. The Joker only ever “loved” Harley when he needed her. The only person to really seem to care about Harley was her friend, Ivy. This has become a common ship lately, as has Harley x Deadpool. Many people argue that these ships make more sense, as the love could be mutual and, in the case of Deadpool, the insanity levels better matched. What’s Currently Canon– Harley Quinn began because of the Joker, but then left the abusive relationship. She’s now a much stronger individual, and sometimes shown as a feminist icon of sorts. What’s Logical– Harley Quinn will always love her Mistah J.
What’s Popular– The Princess of Pranks and the Merc with a Mouth. What’s Your Opinion– Chime in below with a comment! "If you're tryna scare me, it won't work. Cause Mistah, I've seen scary, and you ain't got his smile." Welcome to Queen of Arkham! QoA is a Harley Quinn fansite/blog here to keep you up to date on the coolest new fan art, fanfiction, and updates in the world of Harley Quinn. 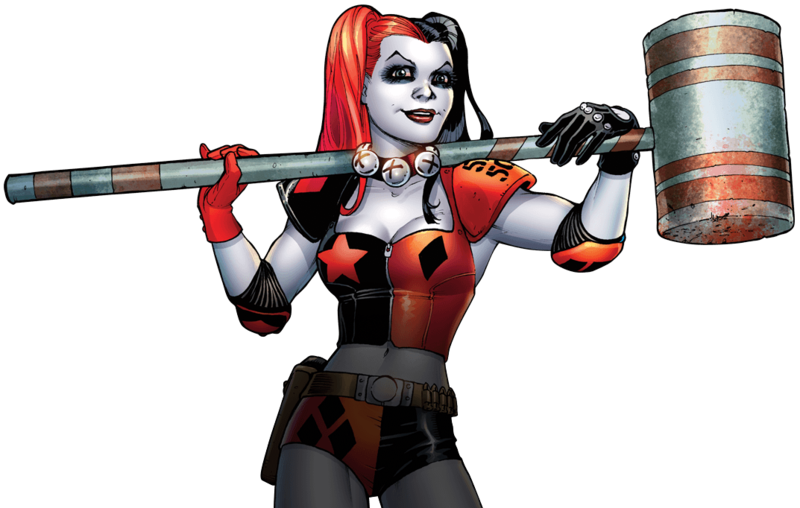 We’ve also got a closet full of fun facts, as well as an overview of Harley Quinn’s history as both a character and a villainess. So step right up, Ladies and Gents!